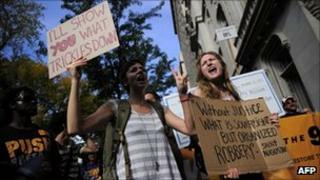 Iran's supreme leader has told a mass rally that the Occupy Wall Street movement will bring down capitalism in America. Ayatollah Ali Khamenei said the US government could crack down, but would not be able to stop the movement. Occupy Wall Street is a leaderless group of peaceful protests speaking out against corporate greed and economic inequality in the US. The protests have spread to dozens of US cities and are in their fourth week. Mr Khamenei, speaking to tens of thousands of people in the western Iranian city of Kermanshah on Wednesday, said the US was in crisis because its "corrupt foundation has been exposed to the American people". "They [US officials] might be able to oppress the uprising," he said, according to a translation of the speech by BBC Monitoring. "However, one day the developments will become so big that it will cause the capitalist system of the USA and West to collapse." He said the world was at "a historical turn" and the West had reached a dead-end. The comments were not the first made by Iranian officials, who have already referred to the Occupy Wall Street protests as an "American Spring", likening the demonstrations to this year's uprisings against autocratic rulers in the Middle East. More protests are planned in the US on Wednesday, with a group called Occupy Cincinnati organising a march in that city in the state of Ohio. Activists in New York plan to gather at the headquarters of JP Morgan Chase to continue protests against the expiration of the state's 2% "millionaires' tax" in December. Meanwhile, Occupy Seattle activists have applied for city hall's approval of long-term occupancy for their protest. On Tuesday, protesters marched past the homes of corporate executives such as JP Morgan's chief executive Jamie Dimon and News Corp chairman Rupert Murdoch in New York City's Upper East Side. It was the first time tycoons had been singled out in such a way by the protesters. In Washington DC, six people were arrested on Tuesday for demonstrating inside a Senate office building. More than 125 protesters in Boston were detained after they ignored warnings to move from a green space in the city, police said. Occupy Wall Street protesters - based in Zuccotti Park in Lower Manhattan - say the wealthiest 1% are getting richer at the expense of the rest of America.